They must have been the ultimate Anglo-American supergroup, though that was never their avowed intention. 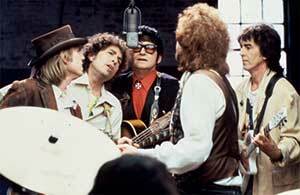 Traveling Wilburys actually fell together by accident. 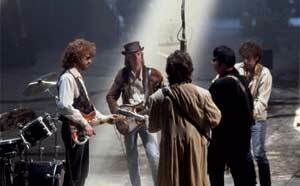 The kismet can be linked to George Harrison and Jeff Lynne’s fortuitous meet in Los Angeles in spring of 1988, with the former looking for studio time to record a B-side. Mutual friends Roy Orbison and Bob Dylan would join the former Beatle and the Move/ELO stalwart, and then, as if that weren’t mind-boggling enough, George was doing some business at Tom Petty’s house, and the laidback Floridian hopped aboard. Well you would, wouldn’t you, given that lot’s track record! In keeping with Harrison’s love of a practical joke and well-chosen pseudonym (or alibi), the quintet adopted alter egos: George became Nelson; Lynne settled on Otis; Dylan plumped for Lucky; Roy took the country option with Lefty; and Petty’s handle was the grand-sounding Charlie T, Jr. While they made two albums, they would never use their real identities. Old masters of the masquerade for sure, but the two discs they left behind – the second was recorded in the wake of Roy Orbison’s posthumously released album Mystery Girl (Roy died in 1988, aged just 52) – are packed with great songs, some real Dylan gems, classic Harrison licks and a smooth country-rock sound courtesy of Petty and Lynne’s studio expertise and genius for harmony and melody. Both albums are recommended for discovery, particularly if you are a fan of any of the above – chances are, you love ’em all. 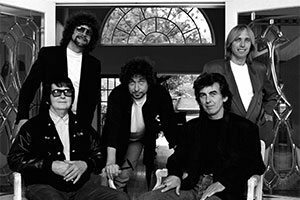 While they were only properly extant during the years 1988 to 1990, Traveling Wilburys had plenty of previous. George Harrison was pondering what to do after releasing his Cloud Nine album and, during a radio interview in LA, he conversationally dropped the bombshell that he’d like to link up with some mates. 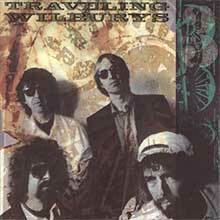 He already had the concept, since the name Traveling Wilburys had been an in-joke for him and Jeff Lynne. The idea snowballed and became a reality. Over a meal with Roy Orbison, it was decided to put plans into place and Bob Dylan was contacted for the use of his Malibu studio. As luck would have it Bob wanted in, and when Harrison went to collect a guitar he’d stashed at Tom Petty’s home, he too expressed an interest in joining the session that resulted in ‘Handle With Care’. 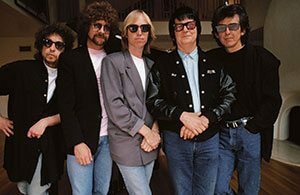 This song was deemed so good that it was used to open the Wilburys’ debut album, Traveling Wilburys Vol 1 That track became their most successful single, with high placing in the US, UK and Australia. A definitive country-rock’n’roller with a descending folk-rock chord sequence and an opening salvo that recalled ELO’s ‘10358 Overture’, ‘Handle With Care’ was completed with drummer Jim Keltner. 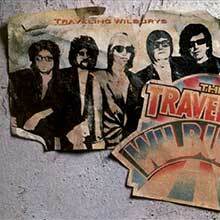 Though events surrounding Orbison’s unexpected demise caused the remaining four Wilburys to take stock, they had the Wilbury bug, and the second album, confusingly called Traveling Wilburys Vol 3 (a piece of Monty Pythonesque espionage hammered home by the fact Michael Palin wrote liner notes for the debut, and Eric Idle did the same for the new recordings) was rushed out in Autumn of 1990 while lead-off single ‘She’s My Baby’ was on the airwaves. Featuring Gary Moore on lead guitar, Jim Horn on sax, Ray Cooper on percussion and Keltner (aka Buster Sidebury) behind the kit, this joint effort was credited to four new folks: Clayton (Lynne), Spike (Harrison), Boo (Dylan) and Muddy (Petty). Once again, Dylan stepped up to the plate with some exceptional songwriting. ‘If You Belonged To Me’ and ‘Where Were You Last Night?’ are full of his colloquial genius, and ‘7 Deadly Sins’ is vintage Bob. Petty stretched out more here too, combining with Dylan on ‘Inside Out’ and bossing the room on ‘Cool Dry Place’ and ‘You Took My Breath Away’. The George’n’Jeff camaraderie shines through on ‘New Blue Moon’; the closing dance number ‘Wilbury Twist’ (“Grace is the key to successful dancing,” according to Eric Idle’s notes) was a fitting finale. The reissue bonus tracks restore ‘Nobody’s Child’ to the fold, while there’s a stirring corer of the Del Shannon hit ‘Runaway’ (tying in with the fact that Tom Petty And The Heartbreakers were working on a new album with the great man, Drop Down And Get Me – and very fine that was as well). 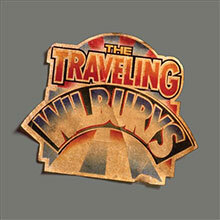 Both of the Wilburys’ essentially good-natured and entertaining albums are also available on the box set The Traveling Wilburys Collection, with a DVD featuring their five music videos, a tongue-in-cheek documentary called The True History Of The Traveling Wilburys (rest assured, it’s not) and a choice of formats including the desirable deluxe edition, linen-bound and containing a collectible book for the connoisseur. You might then hunt down the vinyl edition, since that comes with a bonus 12” featuring some extended versions and a great remix of ‘Not Alone Anymore’. The box was issued six years after George’s death; his son Dhani plays lead guitar on Bob Dylan’s ‘Like A Ship’ and adds backing vocals to that and the reconfigured ‘Maxine’, a song that his father had written, so bringing the project to a suitable close. He was probably right, but then we still have the original music made by the five sons of Charles Truscott Wilbury, Sr. Sir, we all owe you a big one.